For a while now, one of our most frequently requested features has been a text stencil that’s easier to handle. Today we’re proud to say: Voilà, here it is! As off today, creating prototypes in Pidoco will be even easier than before, with a text stencil, which is more powerful, easier to use and, most importantly, includes new functions like inline editing and linking. Inline Editing: Up until now, editing text in Pidoco required you to open a tiny text editor window in which you could edit the text, but you would only see the final result after closing it. With the new text stencil, you can now enjoy direct in-place editing of your text elements, which lets you see formatting and other changes as you type. With the introduction of the new text stencil, we are also getting rid of the distinction between “Plain text” and “Styled text”, a choice you had to make before. From now on there will only be one type of text that can do it all. Now, when adding a text stencil to your canvas or editing text, a toolbar will appear directly above the text, giving you easy access to all available formatting options. In-Text Linking: The new text stencil makes it easier to place links into your prototypes by allowing you to directly insert a link into any part of the text. You can either link to other pages of the prototype by picking a target page from a dropdown or link to an external URL. 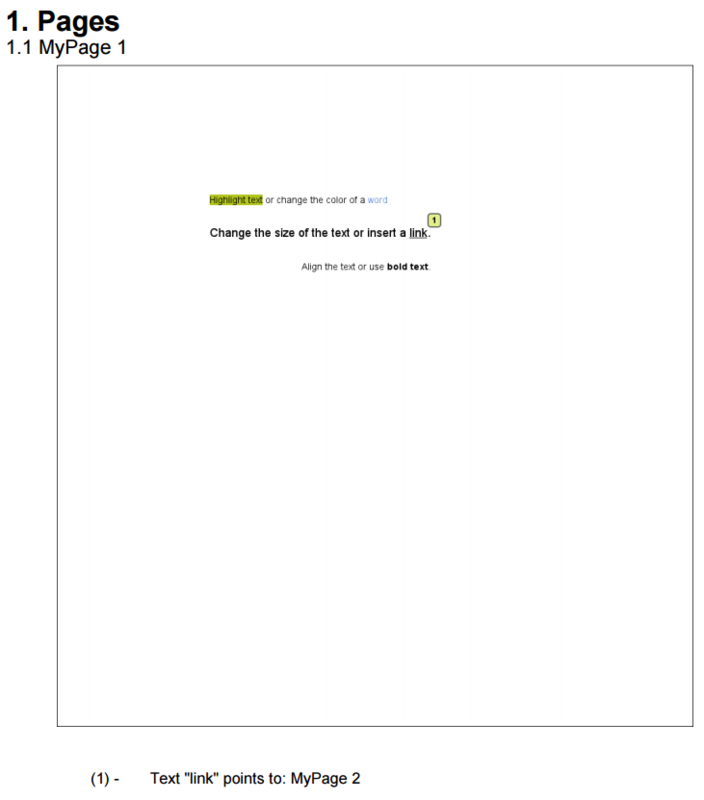 Improved Auto-Sizing: Another novelty is the auto-resizing of text elements. The new text stencil automatically adapts its width while you type and has been optimized to require less manual resizing. Of course, you can still resize texts manually, if you need to. Optimized Output: Finally, we have also reworked both the simulation of the prototype and the specification export to make your work shine. Our optimized specification export makes your work shine. The above improvements also apply to text-base stencils like headlines, text blocks, or links, which are now based on the new text stencil and can be edited with only a few clicks. All your previously created prototypes, using the old text stencil and the text types “plain text” and “styled text”, will still function like before and remain unaffected by the recent improvements, save the optimized simulation and exports. Existing text elements can still be edited like before. 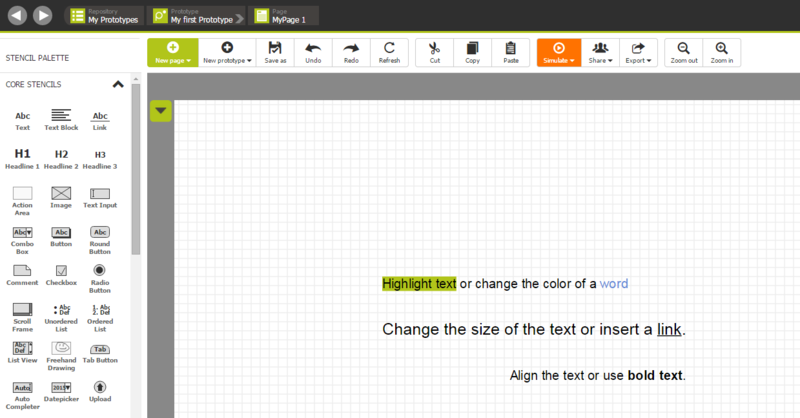 All new text elements, however, will be created using the new text stencil.